Huawei is a master at churning out quality mid-range handsets and the G8 is no exception. It's a fuss-free smartphone with a decent feature set. A quick skip down the spec sheet of the newly announced Huawei G8 and it's not immediately obvious how it differs from the equally new Huawei Mate S.
Launched subltely alongside the Mate S, the G8 only got the briefest of mentions at Huawei's IFA 2015 press conference - there was, after all, a fashion show it needed to start. Seriously. The catwalk got more time at the show than the G8. 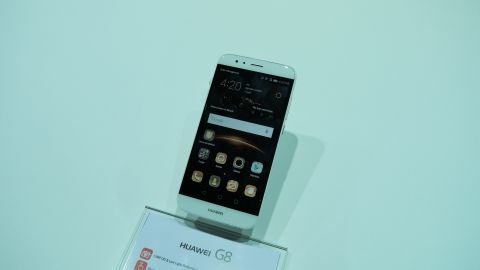 Questionable presentation aside the Huawei G8 is an intriguing smartphone as it takes many of its cues from the premium Mate S, yet manages to offer them up in a more affordable guise. It's set to arrive in a number of countries this month, with the UK and Australia some of those first in line. The Huawei G8 is priced at €399 (around £300, $450, AU$640) SIM-free, which will see it fall in line with the likes of the OnePlus 2 and Moto X Play. Like the Mate S, the Huawei G8 sports an all-metal body, providing a premium look and feel in the hand. Even though the body is just 7.5mm thick, the G8 does feel chunky. That may be partly due to its weight. It's pretty heavy at 167g, and that's noticeable after you've been holding it for a while. It's bezel heavy above and below the display too, adding to the height of the handset, while round the back the metal unibody is broken up by two sizable chunks of plastic. That gives you a good hint that it's not a high-end handset. Also round the back is a fingerprint scanner, which has been updated to Fingerprint Sense 2.0. It's better at recognising your finger, allowing you to unlock the handset in a flash. You can also use it for other tasks, including dragging down the notification bar, answering calls and flicking through images in the gallery. It's an impressive offering which works very well. The power/lock and volume rocker keys are located towards the top of the right side of the G8, and with its sizable 5.5-inch display those with smaller hands may find them a little tricky to hit. That 5.5-inch display boasts a full HD resolution and a pixel density of 401ppi, providing a crisp, clear viewing experience. It's not the brightness screen I've seen on a smartphone, but it's perfectly serviceable. You'll find Android 5.1 Lollipop running on-screen, which is good to see, although Huawei has covered it in its questionable Emotion UI. I still find the interface a little jarring, as it's more suited to Asian palettes and the design and layout doesn't translate as well in other territories. It looks and feels a little childish, although there are a selection of themes allowing you to change it up a bit. None of them are particularly standout, but you should find one that doesn't offend you too much. Running the show is a Snapdragon 616 octa-core processor - a slight upgrade on the 615 chip - and 3GB of RAM. Android felt fluid under my finger and I was able to skip around with ease. I did notice that apps could take a split second longer to load compared to high-end handsets, but that's to be expected at the G8's price point. Turning attentions to photography and the Huawei G8 is well equipped, with a 13MP rear facing sensor and 5MP front snapper. There's OIS (optical imaging stabilisation) built into the rear camera from improved low light photography, and a dual LED flash will help you light up your subjects. Huawei always produces solid low and mid-range devices and the G8 is another that can be added to the roster. The fingerprint scanner is impressive, although with stiff competition from OnePlus and Motorola it may find it difficult to really stand out. There's the promise of decent battery life from the 3000mAh power pack, but you'll have to wait for our full review to see if it manages that. If it can, then you may want to check out the Huawei G8.